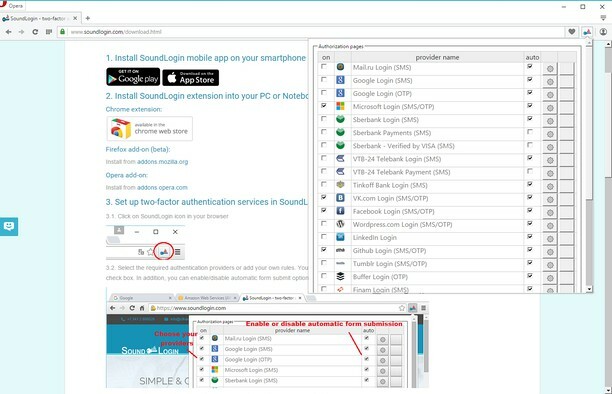 SoundLogin is a technology that simplifies two-factor authentication process. To use it install SoundLogin Authenticator app on your Android (https://play.google.com/store/apps/details?id=com.cifrasoft.cifrasoftauthenticator) or iOS (https://itunes.apple.com/us/app/soundlogin/id918478376) device and browser extension on your PC or Notebook (PC or Notebook should be equipped with microphone). SoundLogin supports multiple services that offer two-factor authentication via Google Authenticator or via SMS, such as Google, Microsoft, VK.com, Wordpress.com, GitHub, Evernote, Amazon Web Services and many others.